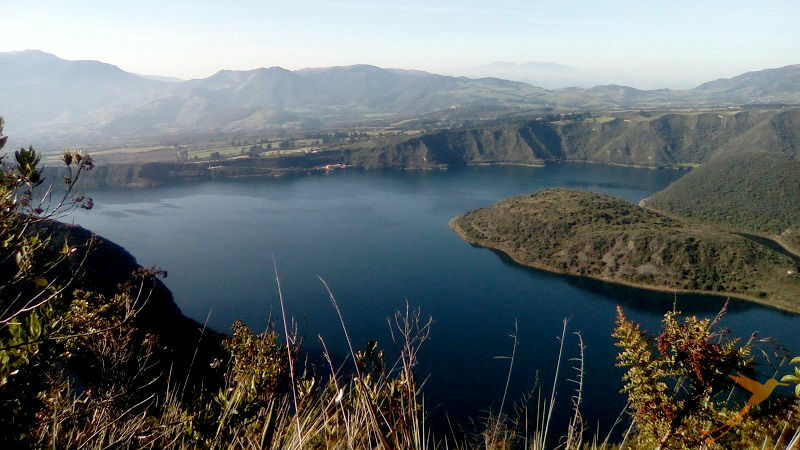 On one weekend, when I was in Otavalo, I decided to circle the Cuicocha crater lake – or at least I wanted to try it. I had been there before but never walked around completely. So, this was still on my to do list for Ecuador. Cuicocha is situated near the small town of Cotacachi at an altitude of 3.060m and part of the Cotacachi Cayapas Ecological reserve. 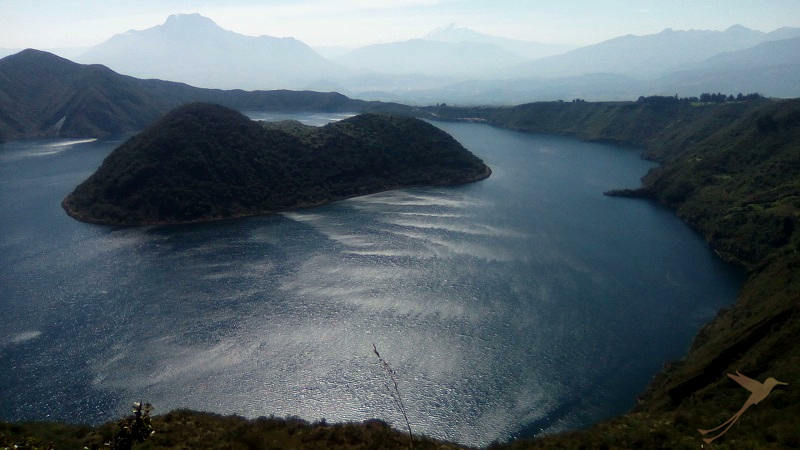 The lagoon has volcanic origin and fills the caldera of the Cuicocha volcano. It is considered a sacred lake and purification baths are carried out every summer solstice. 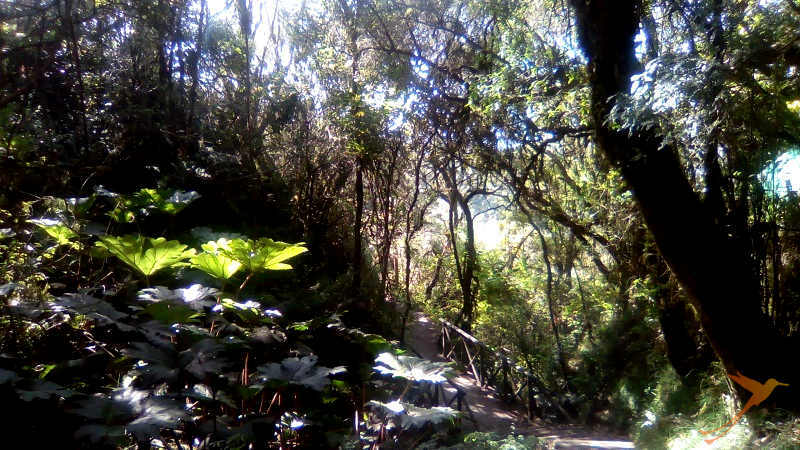 I got up early in the morning, took a bus from the Otavalo bus station to Quiroga, a village near Cotacachi and from there I had to take a taxi to the entrance of the reserve because there is no public transport. The taxi ride took about 10 minutes. I was the first person to enter the reserve on this day, actually I was there before the official opening time which is 8:00 am. But the guardian was so friendly to let me in. The weather was spectacular. It was still pretty cold and the surrounding mountains slowly appeared through the dawn and a bit later there was clear blue sky and a sun shining so strong – and still low – that it was almost impossible to keep the eyes wide open. But anyways I better looked on the narrow and pretty dusty path that leads all the way round the lagoon, going uphill and downhill. From every elevation I had great views over the lake with its small islands and over the surrounding landscapes. The closest volcano you can see there is the Cotacachi. 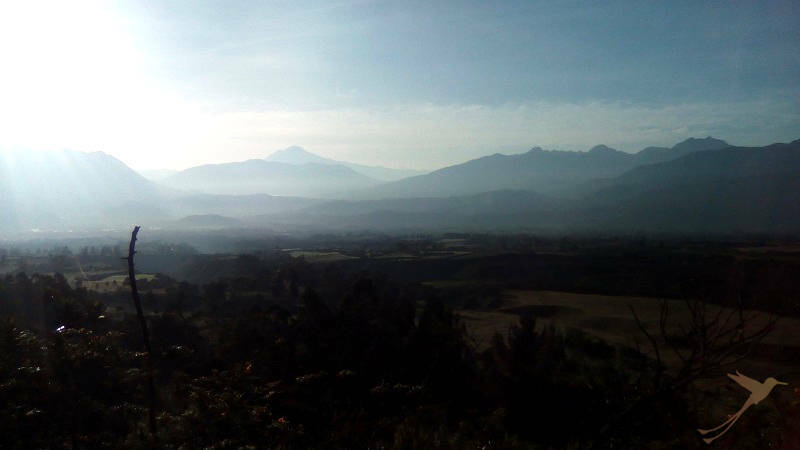 In western direction there is the majestic shape of the Imbabura volcano and further behind in the same direction I could see the snow-covered Cayambe volcano. In the background there were even more elevations to spot but I could not identify them by name. Also the vegetation is very interesting. It varies from paramo plants to cloud forest vegetation with an amazing variety of tiny flowers. I really liked the slightly changing landscape. The first quarter was the typical Andean landscape with low bushy vegetation. Sometimes the path led away from the crater rim to half-circle a hill before returning to the rim and the great views again. Later on I passed through some “tree tunnels” and the landscape turned into a more forest-like setting with epiphytes on the trees, ferns and gunnera. The sunlight reflected on the water drops on the leaves and in the spider´s webs – it was beautiful. The last part of the way led along fields such as corn fields and there were some farmers working the land. The trail, which had taken me about 4 hours, ended at the lagoon’s restaurant and parking space. I was lucky because there was a private tourist bus that took me back to Quiroga and from there I took the public bus to Otavalo. This hike is a good option to get to know the Andean landscape and one of the many crater lakes in Ecuador. 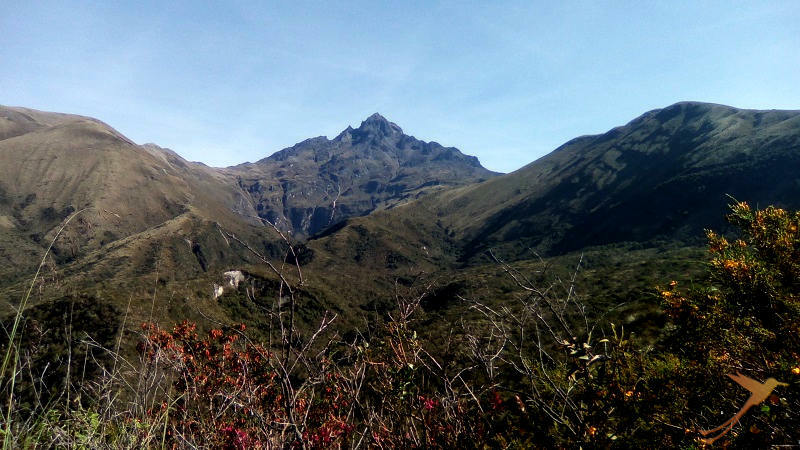 It is also a good first preparation to get used to the altitude and to train for more challenging hike like the Condor trek or the Quilotoa Loop.